After making a Hot Chocolate Cocktail for a cozy winter night, I wanted to go in the opposite direction and make a winter cocktail inspired by the icy blizzards outside. This Blended Frostbite Martini is a cold yet smooth and refreshing drink I can imagine Jack Frost himself would be a big fan of! This cocktail is a winter update on a Pina Colada recipe, however instead of relying on pineapple juice for that hint of citrus I went with some Blue Curaçao to give it both flavor and color. 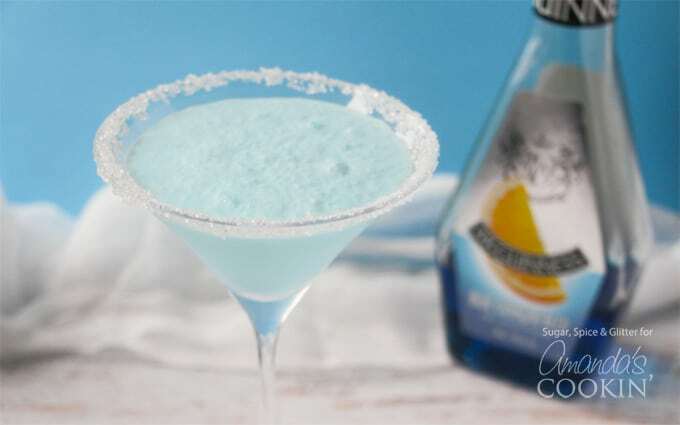 You might remember the Blue Mermaid cocktail from this summer which also uses Blue Curaçao. Blue plays a part in both summer and winter. In the summer it reminds you of the pool and the beach, while in winter it reminds you of snow and ice. 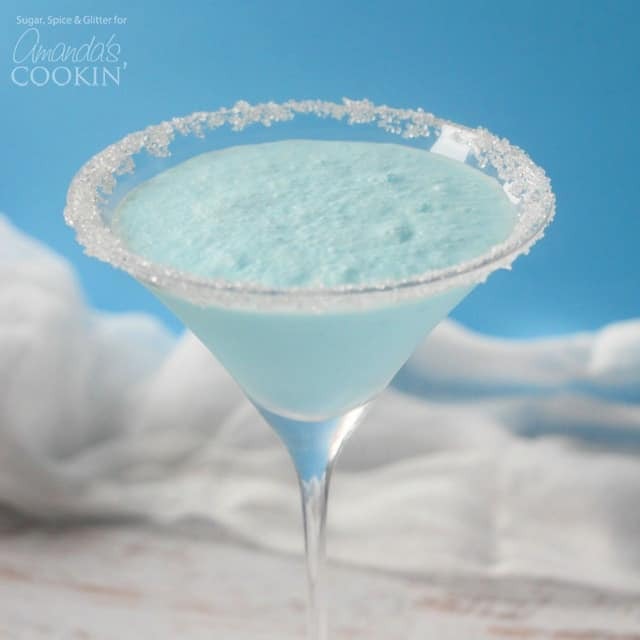 From the sugar dusted rim, to the perfectly blended icy cocktail, this Blended Frostbite Martini is a cute homage to winter. It would be perfect for any winter party or a Christmas get-together with friends – and with that in mind, I’ve made the recipe big enough to serve 4, though it can easily be doubled or tripled! 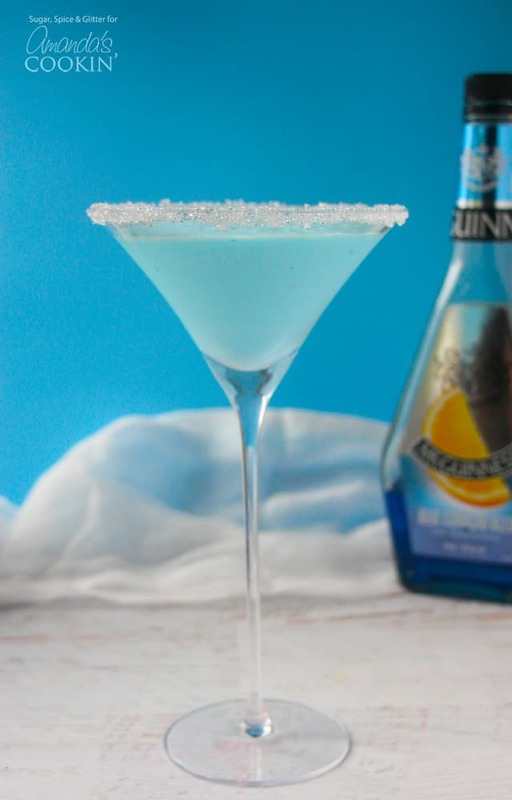 A surprising taste of summer all dolled up to look like winter, this Frostbite martini is sure to please and impress your guests – or just make it for a fun night in. Coconut cream and white rum help finish off this holiday worthy cocktail. Place the coconut cream, ice and alcohols in a good quality blender and mix well, until ice is a consistent and smooth texture. Dip the edge of the martini glass about 1/4 inch into water, and then dip into a dish filled with the sugar crystals to create a sugared rim. Repeat with 4 glasses. Pour 1/4 of the cocktail mixture into each glass and serve. Do you have a special occasion coming up that this Frostbite martini would be perfect for? What’s your go-to cocktail in the cooler months? 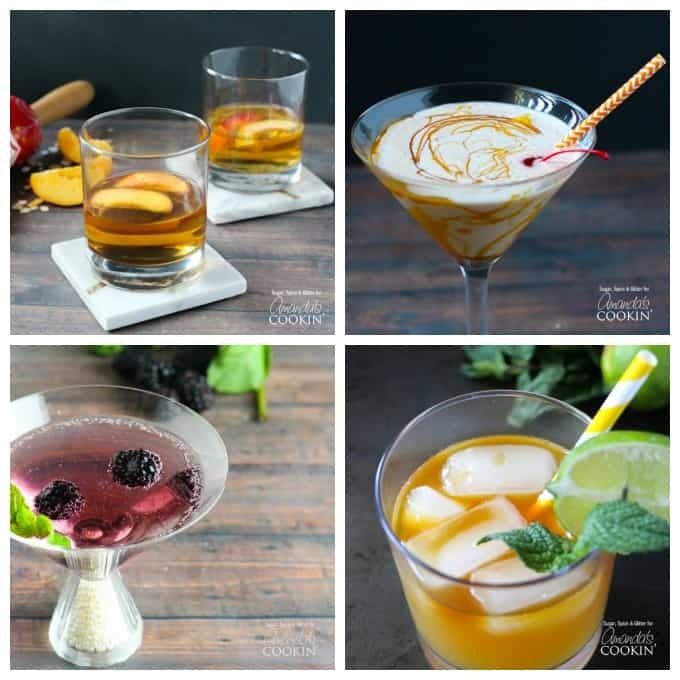 We’ve been putting together cocktail recipes for months, here’s just a sampling of the deliciousness you can find here. If pie is your thing, this peach pie cocktail is right up your alley and also perfect for fall. Being big ice cream fans around here, the butterscotch milkshake cocktail is one of our favorites! Blackberries are in season in the summer, but they can be had all year. So be sure to try ourblackberry gin martini at your next cocktail party. While the mai tai cocktail is probably more of a poolside drink, imagine yourself on a tropical island this fall with one of these in your hand.